Another photo from Rick Mansfield (Australia) which was of particular interest. The surroundings looked very familiar and then confirmed that the building in the background is the now 'Fox Revived' in Norwood Hill. The registration on the car is one number away from the Benz owned by our Bryan Goodman. 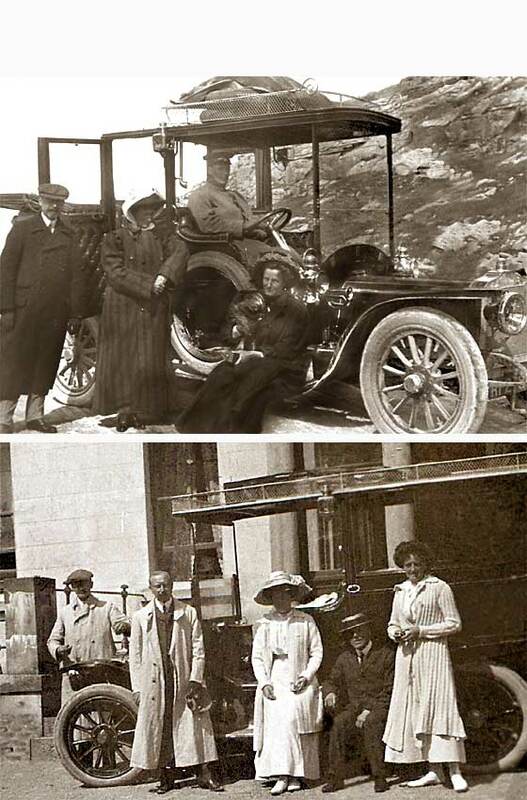 Turns out the car in the picture is a 1900 Benz 5HP owned by a Dr C.F.Wakefield who also owned Bryans car and was a colleague of Dr. Lawrie McGavin, who was Rick Mansfield's grandfather!! Another photo from Dave Sankey (UK) on which he is trying to identify the vehicles. This one shows two cars with what appear to be French numberlates in front of a hotel in the Alpes Maritime on the Côte d'Azur, still around in 1996. It seems the hotel was a part of chain which had a 'summer' hotel and a 'winter' hotel and one in Monte Carlo. The cars in the picture are cca 1904 Peugeot and a cca 1905 Clement Baynard, 14 or probably 20HP. Talbot imported Clement cars to Britain. Another two photos received from Dave Sankey (UK) on which he is trying to identify the vehicles. These are showing two of the family's earlier cars. Again our veteran expert Tim Harding identifies this as a cca 1906 Talbot perhaps a 12/16 but did not identify the other because the relevant bits are hidden by people. 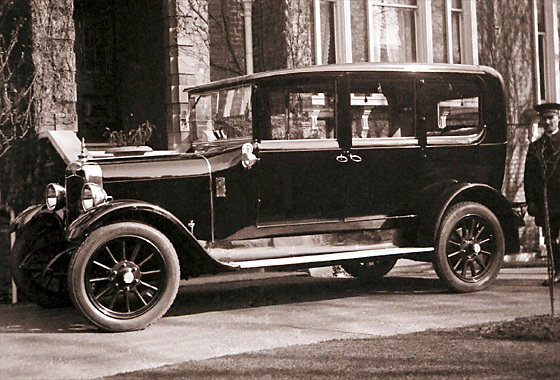 However magnified investigation of the front, specifically the radiator top, seems to suggest this could be the same car, but with a different landaulet body. Earliest of the photos received from Robin McEwen-King of Lanark (UK). 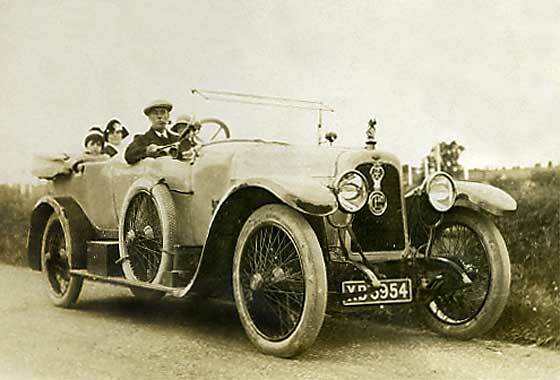 Grandfather Clarence E Hird was a test driver for Rover in the early 1900's. 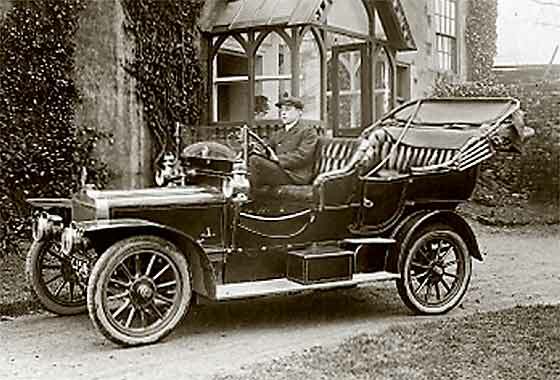 Rover started making cars in 1904 and the shield type radiator was introduced in 1907. This has a more Standard or Talbot type rad and has to be earlier. We believe it is a cca 1907 Rover 16-20, made only '06-07. Rover won the Tourist Trophy in such a car in 1907, and as 'gramps' was the test driver, - this may well have been the very car ! Lovely Photo hanging on the wall in a frame photographed by our Michel Gosset (UK) found while visiting a friend. 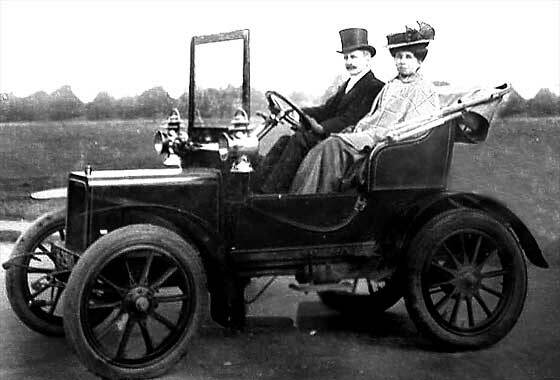 The picture shows a fiend's grandparents photographed in their car of the day. Note the magnificent formal dress and hats! The family had often wandered what the car was but have never been able to find out. We were able to advise that the car is cca 1907 Rover 6HP. These were quite popular in their day and were already establishing a good reputation for reliability. Lovely period photo received from Rick Mansfiel (Australia) of relatives he is investigating standing by their car. The numberplate LB 9588 tells us the car was registered by London County Council. 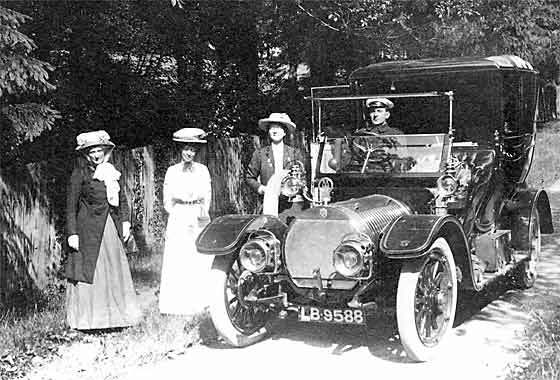 The LB series for cars commenced in March 1908 at number 3001 and ended at 9999 at the end of April 1909. The car was therefore registered March/April 1909. 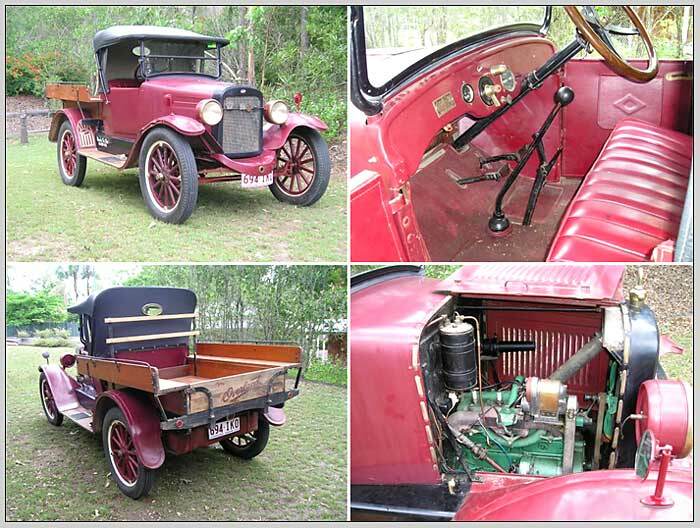 The radiator is quite distinctive, so the car is 1909 Hotchkiss 16/20 or a 20/30. No current UK records, so car may not have survived. Photo received from Graham Johnson (UK) showing his Grandfather Frederick Powell, later described as "Motor Haulier - ex Army", driving a Guest Keen & Nettlefolds delivery lorry, the No1. We can advise that HA-210 was issued by the Smethwick Council. HA Commenced 1st of April 1907. Records lost, but based on the volume of registrations in similar Councils HA 210 would have been reached late 1908 early 1909. 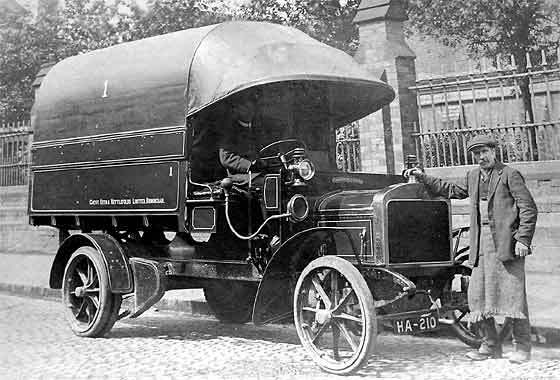 The lorry is therefore a 1909 Thornycroft probably a 2 ton Model 40M2. One of a number of scans of photos received from an Iris in (USA) saying she purchased this 1911 Reanult in the 1980's with the intent of refurbishing it but nothing much has happened to it since. She is now thinking of selling it and wondered what the current value of it would be. Our veteran Renault expert Michael Doughty was not able from the photos to positively identify the model and considers current value to be in a wide band of between £15,000 and £35,000 subject to condition. 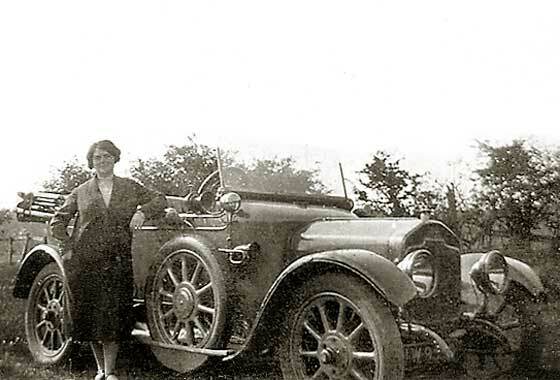 Another photo received from Robin McEwen-King of Lanark (UK), this one showing his grandmother standing next to a car at Belsay in Northumberland. The photo is dated 1925 and should be about right in relation to others. The number is suggested as being LW 8550 or 59. Wanted to know the make, model and place of registration? The car is a cca 1913 Rover 12. Sometimes called the Rover 12 'Clegg' because it was designed by Owen Clegg. LW is a London CC registration, but 1919 ? Another of the photos received from Dave Sankey (UK) on which he is trying to identify the vehicles. This is one of two showing the same but earlier car. A wonderful period photo of the car having just been loaded on board a relatively small ship in a port which, judging by the size of the jetty, is obviously used to housing very large ships. The family seem to have been loyal to their car makes because this car, again as identified by Tim Harding, is a Wolseley, this time a cca 1914 Wolseley. 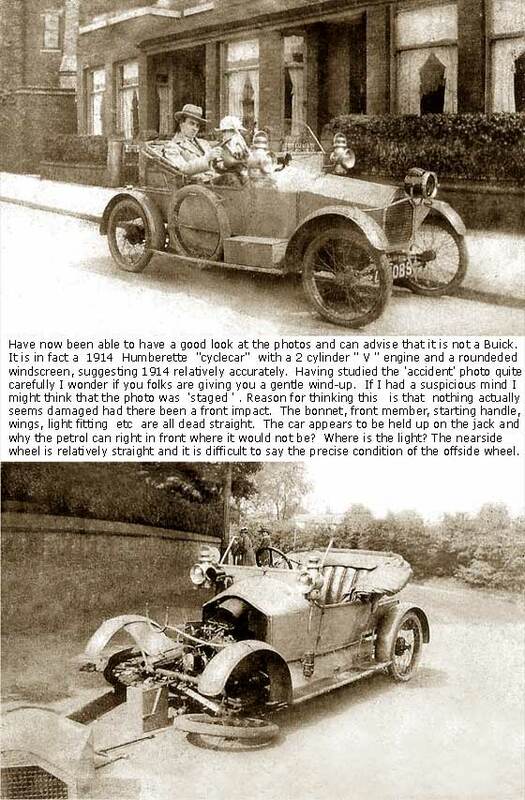 Brilliant Photo received from Steve Norris (UK) of a 'pranged' car which was owned by his grandparents just after they were married in the early 1920's in Manchester. His mother says they had an accident which is depicted in the photo, and she thought the car was a Buick and that it looks like "something out of a film". The car is in fact a cca 1914 Humberette and appears to have had a significant shunt. However, careful examination of the photo reveals some interesting new facts ! 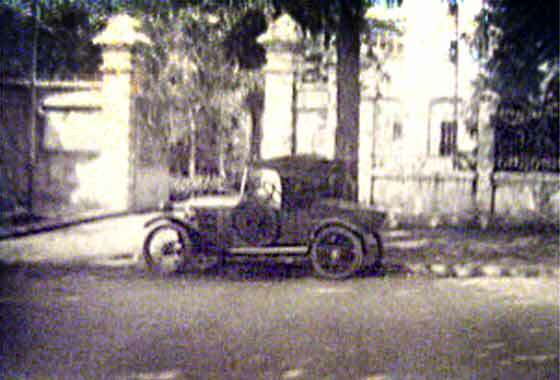 Photo received from Robin and Margaret McEwen-King of Lanark (UK) advising that Grandfather drove for a "Mr. Coakes", and they wanted to know the year and make of car. 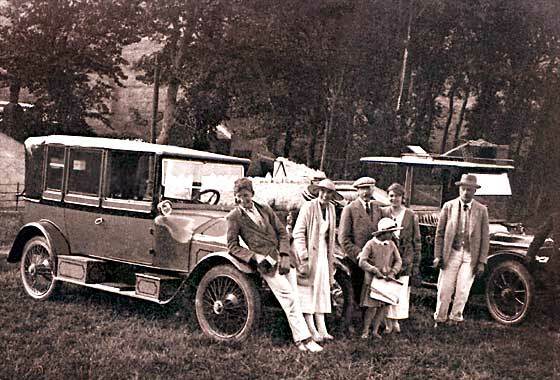 The car is a cca 1920 CGV (Charron, Giradot et Voigt), possibly a Model 18/24. Company became British and this model was sold in the UK until 1929 when the Company closed down. No front brakes, introduced later in 1925. Registration is either XD or XB, both which were London CC and both were issued during 1920. Another of the photos received from Dave Sankey (UK) on which he is trying to identify the vehicles. He advised this one was important to the dating of the pictures and indirectly identifying the family members in other photographs from their apparent ages at the time. Although the relevant bit at the front is obscured, our veteran expert Tim Harding identifies this as a cca 1920 Wolseley, probably a 24/30 All-weather Tourer, with an opening hood. Not enough of the other to see. Lovely Photo received from Susan Lynn (UK) showing her grandmother Charlotte Gunn and her daughter Grace. 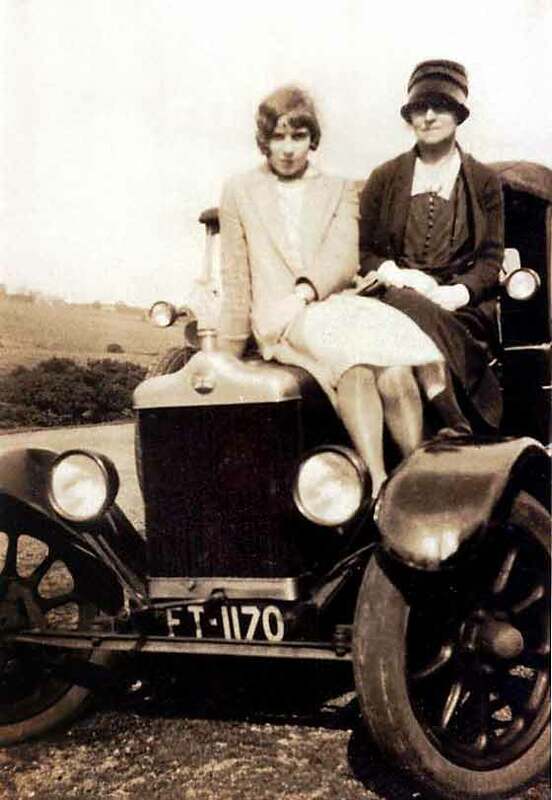 The picture was believed taken about 1923 and it was believed that the car was a Belsize. The registration was believed Tynemouth as the family lived in North Shields. Tynemouth can be confirmed but the registration date cannot be advised accurately because records for this series do not exist. The make of the car is a cca 1920 Standard 9.5 HP Tourer made 1919 - 26. Photo received from George Layton from Bangkok (Thailand). During one of his trips to Phnom Penh in Cambodia (Kamphuchia) he visited a museum that had been abandoned by the Khmer Rouge, the artefacts either destroyed or stolen, but now being restored with many present exhibits labeled 'origin or period unknown'. He was intrigued by a photo of a car and took a grainy snap of it. We are pretty sure this a cca 1923 Benjamin Cyclecar initially made by Maitre & Gerard, - or one of theirs. 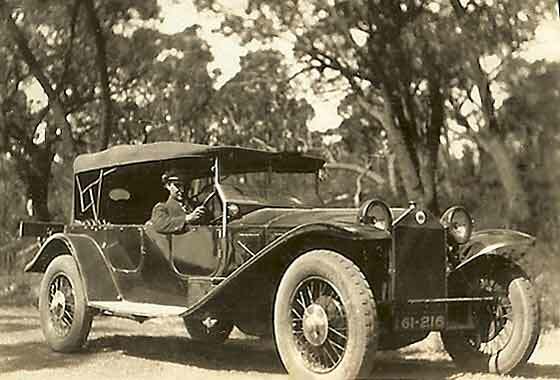 Dashing photo received from Russell Howard from Auckland (New Zealand) showing his wife's Grandfather Les Goodwin photographed at 24 in a car in the Blue Mountains, just outside Sydney in the 1920's. Last fling before he got married, which lasted 72 years until he died at 96. His father a bricklayer from Manchester came to NZ in 1912. The car is a cca 1925 Lancia Lambda. 12,500 Lambdas were manufactured between 1921/31. As this involved 9 model upgrades, precise dating is difficult. Photo received from Dave Sankey (UK) on which he is trying to identify the vehicles. This was one of a number of photos. " Among them are some veteran cars, the identification of which would be of inestimable help in dating the pictures and indirectly identifying the family members in other photographs from their apparent ages at the time." 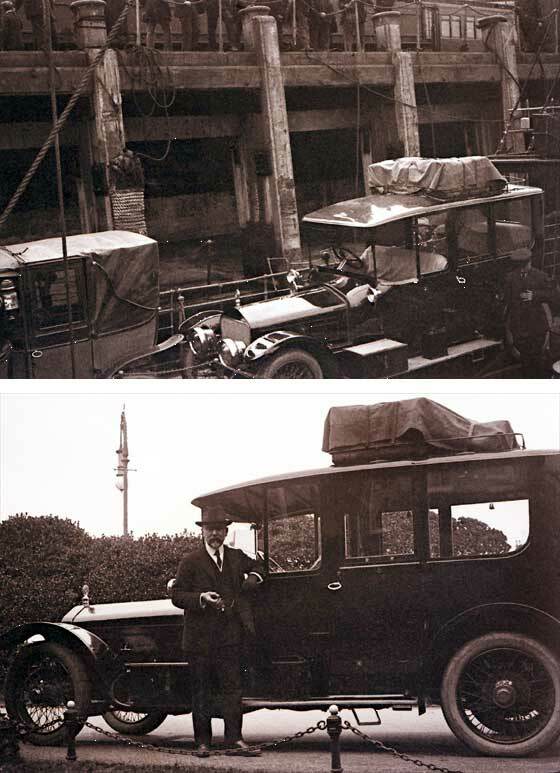 We have started with the most recent simple one which is a cca 1925_Austin_Mayfair_Enclosed_Limousine probably new at the time. Photos received from Mike Barrett (UK) of a relatively unusual vehicle for the UK, this being a 1926 Willys-Overland Type 91. The car was imported from Australia last year and is now in Cornwall, VAT paid, taxed and in a fully serviceable condition. Although built in America, the right hand drive shows the Australian origins. Total rebuild in 1980 and drives nicely at about 45 mph. Car is available for sale, so if anybody is interested please email us and we will put you in touch with the owner. 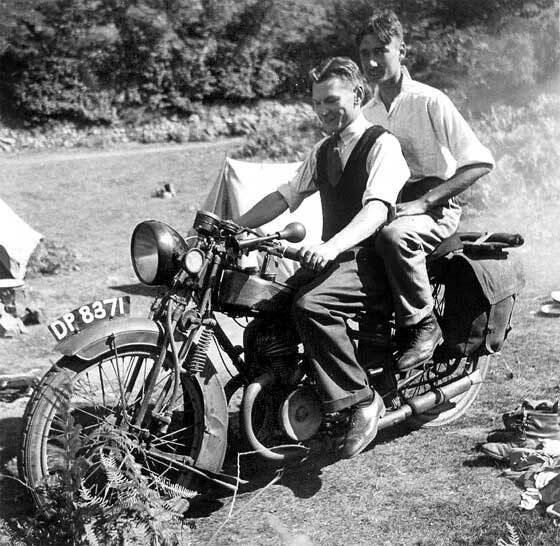 Evocative photo received from Malcolm Buckler (Isle of Man) showing his father Derek Buckler and brother-in-law Douglas Young on a camping holiday, location unknown. Derek Buckler went on to design and make Buckler cars ( http://bucklercars.com/ ). Our motorcycle expert Geoff Morris advised this is a cca 1927 Cotton 250 cc with a Villier two stroke engine, confirmed by the smoke! Dating of the registration number, due lost county records, is late 1927 or early '28. Photo received some time ago from Tony Callaghan (UK) who was researching his family history. We did not provide positive identification but believed the car to be a mid 1920s Clyno. Their subsequent research with National Motor Museum at Beaulieu also came up with a Clyno, a 1928/29 Clyno 12/35 or 12/25. 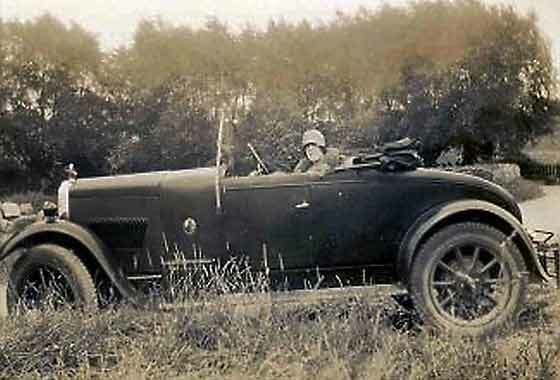 "Honest John" of the Daily Telegraph Motoring Section also thought it was a Clyno 12/35. Suggestions the car may have been rebuilt following an accident due some inconsistencies. Photo received from Annette Hughes (UK) showing what she thought was a Morris van. She thinks the small child in the foreground is her father born July 1928. The driver is her grandfather who worked for John Gardiner, meatsellers in Bermondsey. We can advise that the registration GJ was issues by the London County Council between May 1930 and July 1930. 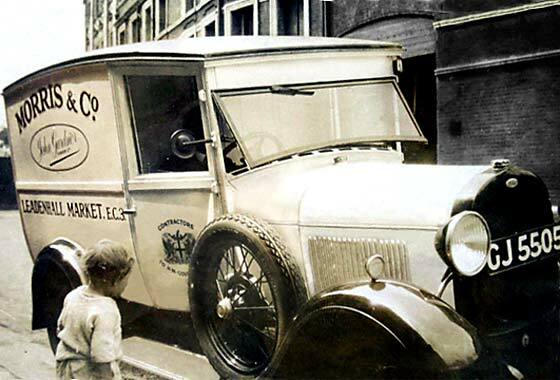 The vehicle is a 1930 Ford Model A Van assembled in Manchester, before Ford built a factory to make cars in Dagenham. Photos received from Ian Moreton (Australia) of a very unusual vehicle he has inherited, purchased by his grandfather, this being a 1949 Morris 10 cwt / Martin-Walter Utilevan conversion. He asked if we could tell him more about it. There seems to be very little information about Martin-Walter and the Utilevan although lots about other conversions. What we have so far found out is on the picture link. If anybody has any information on this exact model, please let us know. Another photo received from Malcolm Buckler (Isle of Man) showing a Buckler car with registration 643 MMY. It was discovered derelict many years ago and rebuilt under a new registration. Malcolm is helping the owner trace the history from photos discovered after his fathers death in 1964. Our information suggests that MMY 643 is a Middlesex County Council registration. MMY 'reversed' was issued between July 1957 and July '58, so being some two thirds of the way through, say March 1958. 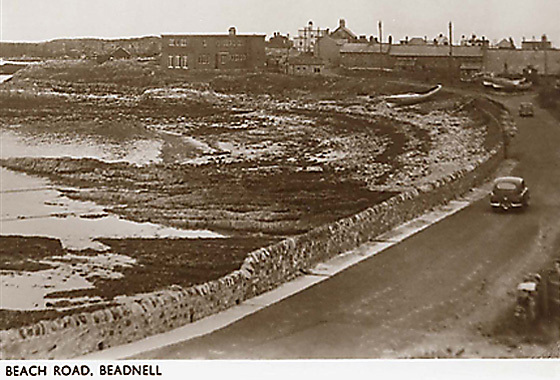 Photo received from Derek Page (UK) requesting help to pinpoint a date in the history of Beadnell Village in Northumberland. He had stayed in the house in the centre of the picture which had a very 30's type style interior. We advised that the car is a cca 1950 Standard Vanguard Phase 1. Phase 1 cars were manufactured between 1948 and 1952 and earlier Phase 1 cars had the numberplate in the rear bumper, as per photo. " You don't get many car pictures taken from the back! "